The Mares Junior X-One and Pirate Set is a great set for juniors as these fins are an adjustable style which is great for growing kids. The Mares Junior Pirate mask and snorkel set is made from 100% silicone and tempered glass. This particular set fits majority of children from 3 - 10 and is super comfortable to wear. Being made from silicone, this mask and snorkel will last many years, as long as it is looked after with correct cleaning and storage. The snorkel that comes in the pirate set has a purge valve at the bottom that allows water to be blown out the bottom rather than all the way up to the top, also it has a wash over valve on the top of the snorkel which minimizes water from entering down the snorkel tube. This particular Mares set comes in pink and blue. 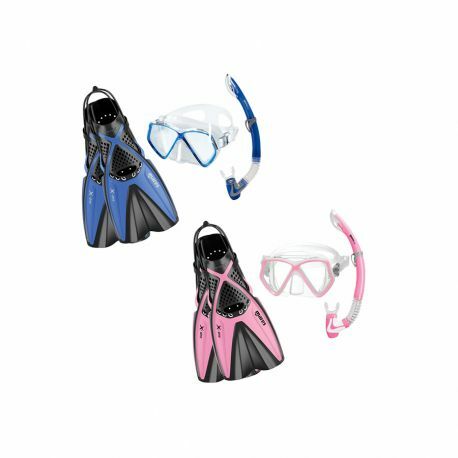 Buying a new set for your child is something that you need to invest in, is doesn't have to be a lot but it will determine if your child will love or hate snorkeling. Purchasing a cheap silitex set will most probably leak, feel uncomfortable and deteriate rapidly. Here at Dive Warehouse we carry only silicone sets. Silicone is much softer and will last and long time. If your child is comfortable in the water, they will enjoy their experience so much more and will be more likely to want to go again. The pirate set is a great choice for a Childs' first mask and snorkel set. How to look after your mask: All of our masks here at Dive Warehouse are made from 100% silicone with tempered glass. When a mask is made, it gets a thin layer of silicone on the inside of the glass. This is what causes it to fog. Anti-fog's will not work until it has been pre-cleaned, as to work it needs to reach the glass and with the silicone layer covering this, it cant work. To remove this layer of silicone, you will need to purchase a pre-cleaner or you can use toothpaste. These products have a slight abrasive in it and will scrub off that silicone layer. A blob of paste on to each lenses on the inside only, give it a good scrub and rinse off with fresh water. Repeat this process 3 times to ensure you have scrubbed off all of the silicone layer, then you can anti-fog. The glass will not get scratched as it is tempered. You can purchase a good quality anti-fog here at Dive Warehouse, or you can spit or lick the inside of the lens as spit is a natural anti-fog! After you have cleaned your mask and are no longer fogging, you will need to wash your gear after every use to prevent it from perishing. The best way to clean you mask and snorkel is to put them in a tub of fresh warm water and give them a good rinse. this will take off all of the salt and sand that you get from the ocean. Store them away in a dark dry place to prevent the silicone from turning an off color. The sun will do this if you store them in direct sunlight. The Mares X-One Junior Fins are a new addition to the Mares Snorkeling range and they definitely fill a gap. These unique medium blade fins will give you all the power that you need when snorkeling, however will be relatively easy on your legs. This is due to the rubber Centre of the blade is flexible enough to catch and hold large amounts of water, there fore giving you more thrust when kicking, especially through currents. Due the medium length blade, they will not be harsh on your legs. A fantastic and unique feature of the Mares X-One Fins are the adjustable bungee fin strap. This means that it is one bit of rubber, no clips of buckles to potentially break so there fore it will last longer with the correct cleaning process. To adjust the strap, you simple turn the fin over where you will see 6 hooks which you can place the strap around, giving you the perfect size. Once you have found your correct fit, you will never have to adjust the strap as it is a bungee strap. Worn with bare feet, they are not designed to fit a boot or reef walker.